The landslide of Köfels covers an area of at least 11,5 square kilometres with an estimated volume of 2 to 3 cubic kilometres, the largest landslide in the crystalline Alps. The landslide descended from the western slope of the valley, damming in transverse the Ötztal and branding against the opposite valley flank, this mass - the Tauferberg - blocked the mouth of the tributary valley of Hoarlach. The river of the Ötztal, the Ötztaler Ache, became dammed to a 7 kilometres long lake. In the basin of Längenfeld lake sediments have been drilled up to a thickness of 92m. Simultaneously the river has cut a deep gorge into the dam, the Maurach gorge is still today the only way trough the landslide barricade. Pieces of wood recovered from a gallery driven in the Tauferberg during exploration work for a power station resulted in a conventional radiocarbon age of 8.710+/-150 years BP (ca. 9.800 years cal BP), this early Holocene age is supported by additional cosmogenic isotope dating of surface boulders that yielded an age of 8.889+/-490 to 10.630 +/-570 years BP. Fig.1. View from north into the valley of Ötz and the landslide of Köfels, on left the Tauferberg with the village of Umhausen in the foreground. On the right the concave escarpment of the landslide that lowered the mountain by estimated 200 meters. Displaced rockslide masses enveloped by stippled dark line. Fig.2. Geological map of the Köfels rockslide area with frictionites sites and (IA) Horlach valley, i.e. place of finding of C-14 dated wood fragments buried by the rockslide deposits. Displaced rockslide masses enveloped by stippled dark line (after PRAGER et al. 2009). The map is mirrored in reference to the previous photography. "…the landslide slide down apparently from the western to south-western mountain ridge above Köfels… great gliding surfacse let recognize the movement of large masses of rocks. 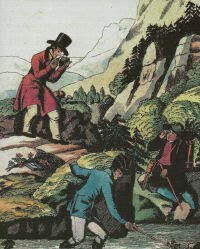 It seems that the ridge was considerably lowered by the collapse by estimated 200m." Ironically it was the shear mass of the landslide that misdirected later authors, observing outcrops of not shattered gneiss inside the limits of the loose debris they underestimated significantly the volume of the entire landslide - it was not yet recognized that the upper part of a large landslide can glide like a single coherent mass. According to the new estimated volume the landslide was considered be only superficial and to "thin" to explain the observed completely shattered rocks underlying it . 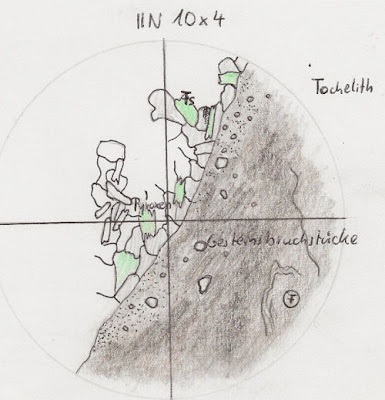 "… a particular kind of formation, for which a volcanic origin or at least influence must be considered, like nowhere else in the interior of the Alps, are the deposits of pumice in the area surrounding of Köfels in the valley of Ötz… a local peculiarity… postglacial liparitic pumice. It is an in part yellow-grey to yellow-brown, sometimes light grey to dark grey, extraordinary foamy, mostly vesicular to in rare occasions fibrous rock, with common inclusions of mylonized gneiss." 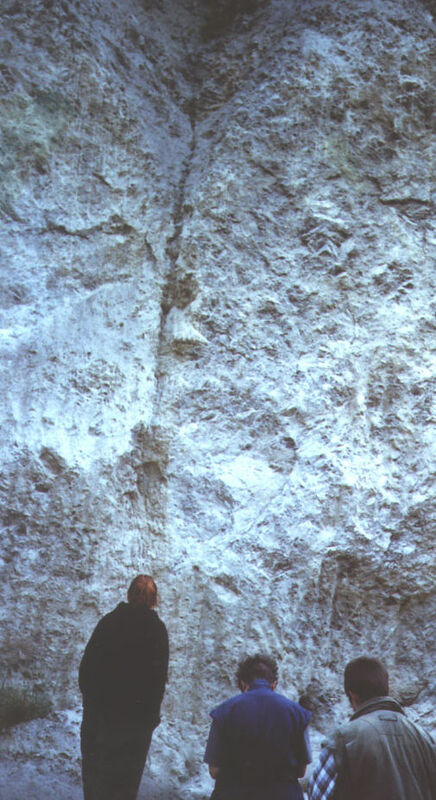 Some authors interpreted the shattered rocks and the pumice as a diatrem or the roof of a magma chamber of a supposedly Post-glacial or Holocene volcanism in the Alps (the landslide incorporates glacial sediments). In 1936 other authors suggested that the rocks are the eroded remains of the ejecta of a Holocene meteorite impact. Both hypothesis however were contradicted by evidence in the field, the supposed ejecta-deposits were found only on one side of the mountain, not scattered around a supposed impact point or volcanic conduit (never found), and the pumice was uncovered by the landslide, not overlying it as expected from a rain of molten rocks after the impact. Only since 1970 with research performed on very large landslides in the Alps and especially in the Himalaya it was realized that the apparently partially molten rock - referred as Frictionite, Pseudotachylite or Hyalomylonite - is the results of friction heat caused by the sliding of gigantic rock masses, a unique mechanisms still today poorly understand. Despite this new evidence, curiously in 2008 the impact hypothesis was revived by some pseudoscientists in connection to supposed observations of a meteorite by the Sumerians or to explain the death of the Iceman as a human sacrifice to prevent a nuclear winter after the impact. Fig.3. Part of the eastern slope of the Maurach gorge where the cutting of a road along the river Ötz has exposed the crushed lower strata of the slide with veins of Frictionite/Pseudotachylite/Hyalomylonite. 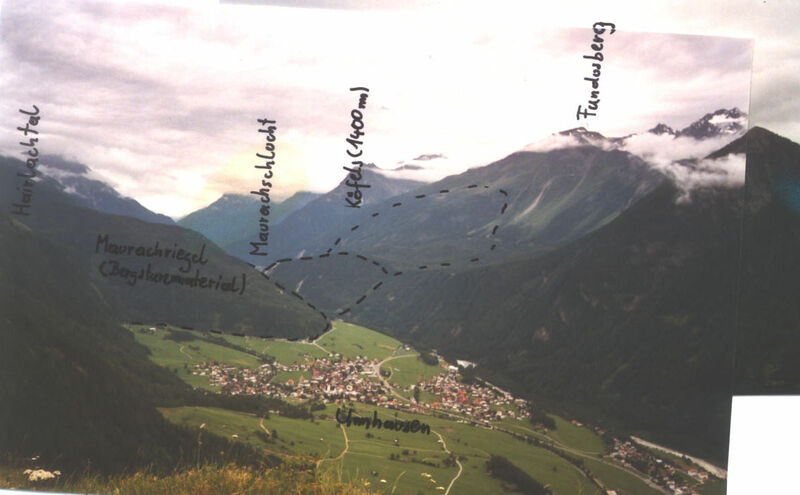 The upper part of the Köfels landslide moved as a large semi-coherent mass, covered by loose debris. Fig.4. Drawing of the microscopic view of a (tectonic) shear plane with pseudotachylite in gabbro (rock with pyroxene and feldspar - Fs) of Rhodos. In the grey homogenous mass of the glass (molten and then quickly resolidified) with a sharp contact to the unmodified rock weak flow structures (F) are recognizable and additionally fragments of the primary source rocks. 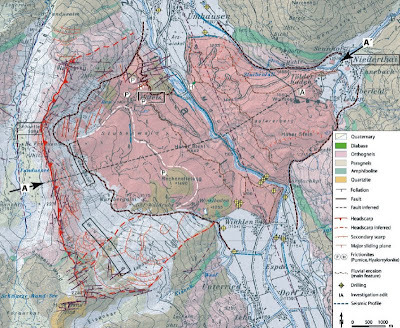 There is a third geological peculiarity of the landslide of Köfels: The village of Umhausen situated north of the landslide is since 1992 notoriously known for its high percentage of lung diseases and cancer of the local inhabitants. The lung cancer increase was caused by the unusual high concentration of the radioactive gas Radon in buildings of the area. The presence of such amounts of Radon baffled experts, well above the natural values expected for the underground geology consisting of metamorphic ortho- and paragneiss. Both rocks contain very small quantities of Uranium, which decaying converts to Radon, but the amount of gas released is as the concentration of Uranium in the source rock itself very small. However the rocks of the landslide deposits, on which the village in part stands, are shattered until the single mineral grains, increasing exponentially the surface emanating Radon.